Perhaps nobody is better than the Coen Brothers at making movies about poor men doing desperate things to attain wealth. They've made an art form out of it, sometimes taking a comic route in doing so, while other times delving into the grizzly darkness of the soul. 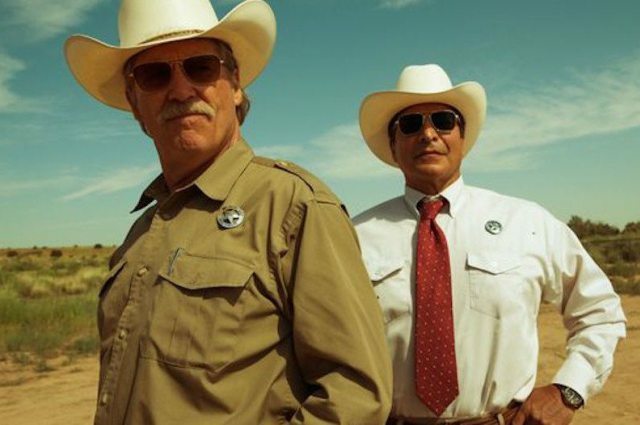 The Coens may not have had anything to do with David Mackenzie's neo-Western heist film Hell or High Water, but their fingerprints are all over it in terms of style, which effortlessly skips between madcap and brutal, and with its assortment of colorful characters of Texas-sized personality. 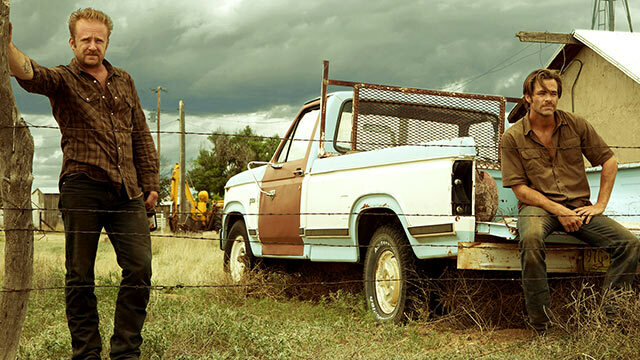 It may be more of a Coen Brothers movie than they've made in a long time, and surely is more enjoyable. Mackenzie may not be a name you're familiar with, but it's time for that to change. He's the director who introduced us to Jack O'Connell with the intense, no b.s. prison drama Starred Up, and his approach here is just as much an in-your-face experience. It's a film of small-town heroes, and heroes in a small Texas town don't tend to be the local Sheriffs. They're the ones on the opposite side of the law, sticking it to the rich fat cats who have made a simple blue collar existence an unattainable fantasy. Chris Pine and Ben Foster play bank-robbing brothers Toby and Tanner, who have a plan to score some cash to save their family farm. But it's more than that; their crusade is as much about vengeance as wealth. Their heists, like the one that kicks off the film, are amateurish at best..."Ya'll are new to this", a bank clerk (Dale Dickie, southern twang dialed up to 11) boldly tells the armed siblings. She's right, but their plans beyond the robberies are pretty slick. The cash they steal is then laundered, thanks to an abundance of Native American casinos in the area, then used to pay off the debts held by the banks they just robbed. Now THAT is what you call sticking it to "the Man", and the locals are willing to put up with the inconvenience of a little bank robbery if the only money being stolen is the banks'. Unfortunately, the Texas Rangers aren't quite so charitable. The second duo involved in this messy situation are grizzled, nearly-retired sheriff Marcus (Jeff Bridges), an ornery, racist cuss who repeatedly pokes at his half-Native American/half Mexican partner Alberto (Gil Birmingham). Screenwriter Taylor Sheridan, following up on his excellent Sicario screenplay, saves much of his whip smart banter for Marcus and Alberto, who trade barbs so stinging it may look like they despise one another. However as the film proceeds along we see that's not the case; there's genuine affection and respect there. If you've ever heard someone say, "I kid because I love", then the relationship between the two cops is a perfect example of exactly that. Sheridan puts us in a predicament where we have a tough time choosing who to root for. Honestly, there are no true villains here, at least not at first. The brothers have a cause they deem to be a worthy, righteous one, and the people of that town support them wholeheartedly. In one terrific scene a waitress (played by Eastbound & Down's Katy Mixon) repeatedly stymies Marcus' attempts to secure a $200 tip she received from Toby, partly because she needs the money and second because she doesn't want to help the people. While saving the farm from foreclosure is paramount to the brothers, Toby's concerns extend to the needs of his family, to make sure the next generation never has to struggle the way he's had to. Tanner, an unpredictable wild card, is a lifelong criminal who initially seems to be in on it just for the money and action. Over time we see that it's about something else entirely, something more personal. Our understanding of these characters continues to unfold throughout; amazing considering the familiar confines of the genre the film finds itself in and is more than willing to embrace. 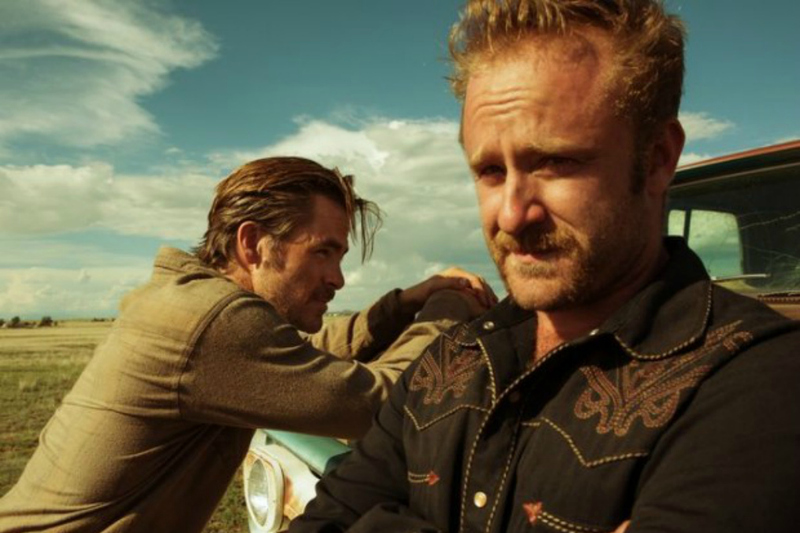 In its depth of characters and understanding of the impact decades of poverty can have on people today, Hell or High Water is more than just another movie about cops and robbers. In solemn tones it pines for an era in which outlaws ran wild and lived long enough to spend the money they stole. In another beautiful, insightful exchange Alberto talks about his Native American people, and how they had everything stolen from them, and now the people of today have had everything stolen from them, only it's by guys in suits sitting behind desks. Performances are strong all around with Bridges settling into a Rooster Cogburn gruffness, while Foster is once again called on to play a loose cannon, something he's quite good at. Pine was the question mark for me as he's not a particular favorite (Okay, I think he's boring as old dry toast) but the sensitivity he brings to the role of Toby is exactly what it called for. He doesn't really fit in this world of guns and ten-gallon hats; he's just trying to make the most of a bad situation. And we can't leave Birmingham out of the discussion, either. As Alberto he's called upon to be the target of Marcus' remarks but as we see later on he's also carrying a tremendous amount of pain from past tragedies inflicted upon his people. We don't realize how crucial he is to the story until a key moment much later on. Don't ask about women because they don't play much of a role, which is typical for Westerns. If there's a stand-out female turn it's by an old, crusty waitress at a steak joint who doesn't take any guff from anybody. She's played by Margaret Bowman who after appearances in The Lone Ranger, Bernie, No Country for Old Men, and Walker, Texas Ranger might as well be part of the Lone Star scenery. Hell or High Water goes out guns blazing in exactly the fashion a film like this should. What's impressive is that the Scottish-born Mackenzie has such a firm grasp on American culture, both its past and contemporary context. He's made a film that is as American as they come; a pure Texas thrill ride that is vitally relevant and yet wildly entertaining.